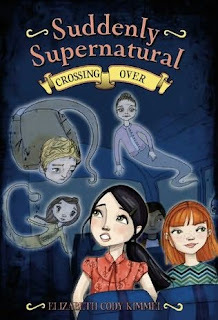 I just love this series - it's about a girl, the daughter of a medium, who is slowly coming to terms with her ability to see spirits - to see them and to help them, too. In this fourth book Kat and her eighth-grade class take a field trip to Montreal. It's exciting to go to a different country, and it's great that Kat's best friend Jac is going with her. It's secretly very great that Ben, a kid in her class Kat recently realized she likes a lot, is sitting just a few rows behind her on the bus. It's not so great that she seems to run into ghosts everywhere she turns, though - especially in Old Montreal. It's kind of difficult to impress the boy you like when you keep talking to people no one else can see. I continue to adore this series. I love Kat's strong narrative voice, the way the story is told so skillfully and believably from her point of view. I love the way relationships are explored: Kat's with her best friend, her mother, the other kids in their class, her secret crush. People change and grow from book to book, becoming increasingly complex, and the adults are depicted as actual people with weaknesses and strengths, who change and grow, too. The books are charming, funny, sometimes a bit dark and bittersweet, as stories that touch on death tend to be. They challenge readers to think beyond the usual, everyday things, and I like that in a book. Beyond Books: "It’s rare that I get this excited over a book. It’s different than with other series that I enjoy. I actually squeal when I see this book in stock." I do hope there will be more in this series! Cat - It was very cool to read a book set in a place I'd recently visited - particularly with a blogging buddy! It did make me wish I'd had more time to explore the city, though, because I loved what little of it I got to see. I hope I can come back soon. There had better be more books in this series - it seems like she's planning more, doesn't it? I'm expecting that the creepy spirit/power from a book or two ago will be back, don't you think? those look like fun books!!! Argh! I feel like I spend so much time writing mine, I have no time to read anymore! Once again, a series that my library doesn't have. However, I must say that there are so many out different series out there that I can't expect them to have them all. ;o) I have read one book by this author, though, The Top Job. It was nominated for the Tennessee Volunteer Book Award this past year. I really enjoyed it. Tamara - Yes, they are very fun - and they are quick reads, too, if that's any consolation! Cheryl - I've been meaning to try some of Kimmel's other books, since I love this series so much. I'll try The Top Job next. Thanks for the recommendation! I hope your library decides to purchase this series soon. Rhinoa - Oh, it is. I know you'd love it!